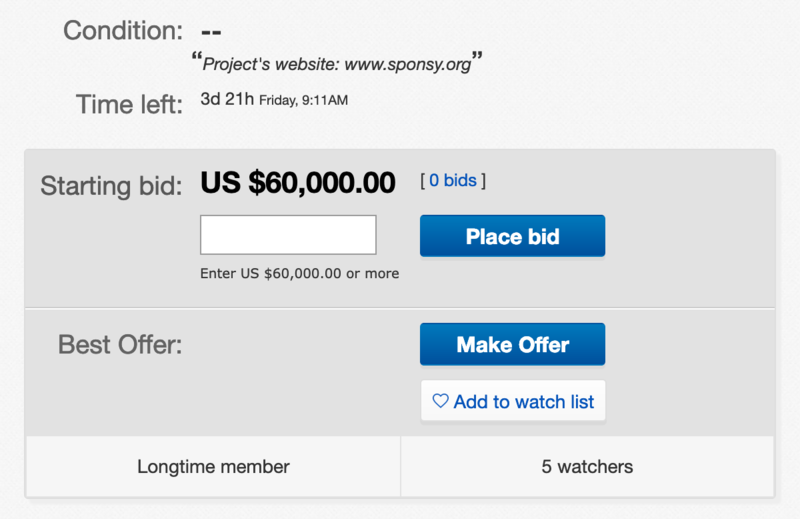 The owner of a blockchain startup, named Sponsy, is turning to the e-commerce website, eBay, where he is trying to sell his failed ICO for $60,000. If you are interested, you will have to hurry up, the sale expires in less than 4 days. The advertisement on eBay lists Sponsy, a blockchain startup which is described as a blockchain project that is fully prepared to launch both ICO's and STO's and apparently was set up to create a distributed software solution for events and brands to manage sponsorship deals conveniently and reliably. The offer further claims that the project was fully audited by an investment firm and approved by investment bankers. On top of this, the advertisement states that the solutions developed by Sponsy comply with European Union and United States regulations. The founder of Sponsy, Ivan Komar, told the Financial Times that the company had missed the ICO hype of 2017, and that therefor no one had shown interest in its tokens later in 2019. Komar's lawyer had recommended that Sponsy developed the product first instead of launching an ICO, a decision that the Sponsy founder now regrets. So what would Sponsy have done differently if they had the chance again? Komar further points out that he thinks that the project can be successfully sold, especially due to the fact that the crypto part can be easily removed from it. As of writing time, no offers have been made to buy the failed ICO, and with less than 4 days to go before the offer expires, it seems likely that this sales attempt as well will end up being a 'Fail'.